ATTEN-HUT! Listen up all you maggots. The sarge was not always a hated villain who supported the Iraqi war efforts. He proved time-and-time again he could portray different characters from flamboyant heels (bad guy) to a masked man to a very over babyface (good guy). He grew up in one of the greatest wrestling states in North America with one of the longest and lushest histories, Minnesota. It's said that Robert, who often went by Bob, legitimately was in the US Military Corp reaching the rank of sergeant. When he returned to Minnesota and decided he wanted to be a wrestler, where better to get trained then at one of Verne Gagne's training camps? Fresh out of the camp with hair dyed blonde and tie-dye attire Remus started his career as Beautiful Bobby Remus. He didn't stay too long in Verne's AWA, he needed to get some seasoning, hone his craft and get to know his own character before he could progress in the AWA. He toured Vancouver with his Beautiful Bobby schtick but he quickly dropped the act. He tested the waters in Pacific Northwest Wrestling under the name of Bruiser Bob he also dropped into the AWA from time-to-time, but never really stayed for any real length of time. Bob experimented under the name Brutal Bob Slaughter too. It was not until 1976 though when the whole package started to come into place. At first he went to the Tri-State area where he competed under the name Big Bob Slaughter starting the transformation into his next character there. Remus teamed with Col. Buck Robley and by March 29 of 1976 the duo picked up the NWA United States Tag-Team Championship (Tri-State Version) by defeating The Hollywood Blonds. It was in the Central States Wrestling territory Remus really came into his own. In the Kansas based territory he adopted the name Drill Instructor Bob Slaughter, with that version catching on so well he decided to cut back on the dates for Leroy McGuirk's Tri-State, and consequently dropped the tag team belts just a month later. Slaughter was a heel at that point, and in many ways he was some what revolutionary. There had been many military personalities in the history of wrestling, however, usually when played by an American, the character was portrayed as a face. Very rarely if ever had there been a sadistic marine sergeant who was said to have been discharged unceremoniously for inflicting pain of the worst kind on young recruits. A lot of fans to this day still remember his feuds against Bulldog Bob Brown and Rufus R. Jones from that period of his career. On January 12, 1977 Slaughter won his first solo championship by defeating Brown for the NWA Central States Heavyweight Championship. A month later he lost it to Ted Oates who dropped it back to Slaughter just a few days later. The feud with Brown picked back up and they traded the title back and forth until May. Slaughter came out with the belt only to lose it to a young Ted DiBiase in May for the final time. Sometime during his run as the heavyweight champion a new addition was added to his military persona, it's said the D.I. came up with it himself. His opponent went out and encouraged the fans to chant 'GOMER' (After the TV character); it worked and soon chants of "GO-MER!" filled arenas everywhere he went. Remus decided it was time a leave Bob Geigel's territory a few months after the title loss. He made a short appearance in Georgia Championship Wrestling under a mask as the Executioner. There he picked up tag gold with Pak Song. Not long after Remus left Jim Barnett's territory and reappeared with a brand new character back in his home territory. Super Destroyer Mark II - a character which filled the space left by the Mark I Super Destroyer, Don Jardine - arrived in the American Wrestling Association contracted to already established manager, Lord Alfred Hayes. Following an initial feud with Da Crusher, one of the biggest stars in the area for many years, Remus entered into a feud with the AWA British Empire Heavyweight Champion, Billy Robinson. The feud resulted in Remus beginning a run with the championship on October 25, 1979 holding the title for just a couple of weeks before dropping it back to the technically sound Englishman. Around that time Remus got himself another partner by the name of Super Destroyer Mark III. For the most part of his time under the mask of SD Mark II, he didn't speak a word. Hayes did all the talking for him. That all changed, very briefly at least, as Slaughter fired his manager Hayes to forge an alliance with Bobby Heenan along with Mark III. Shortly after Remus and Heenan dropped SD III, who went and aligned back with Lord Alfred Hayes. Remus and Mark III feuded for the next couple of months in the AWA, Mark II was the heel in this exchange. Then in 1980 Bob received his first call from the World Wrestling Federation. Whilst in the territory still based in the Northeast, Sgt. Slaughter came into full effect with the Grand Wizard by his side. Slaughter started in the WWF as he left off in the Central States; a drill instructor like heel. He locked on the cobra clutch in challenges where people could win a large sum of money if they could break free. For the entirety of 1980 though Remus kept donning the mask in the AWA. It was toward the summer of that year that Mark II became a babyface when he dropped manager Bobby Heenan and entered into a feud with his family, most notably Nick Bockwinkel. Until Super Destroyer Mark II simply vanished from the wrestling scene. Back in the WWF during 1981 Pat Patterson got the closest to breaking the "Cobra Clutch Challenge" and in return the fans got one of the most fondly remembered matches from 1981. If you haven't seen it I recommend you find the Alley Fight the two men had. With the success of Slaughter in WWF he went on tour with it. Jim Crockett Promotions saw Slaughter reach the peak of his success up until that point in time. Seen by millions across the nation and getting completely hated as a heel, Slaughter defeated a super over babyface on October 4, 1981 in the finals of a tournament for the vacant Mid-Atlantic Version of the NWA United States Heavyweight Championship. Over the course of the next 229 days the Sarge defeated everyone that was thrown at him. Roddy Piper, Jack Brisco, Barry Windham, and Jake Roberts, as well as challenging Ric Flair for the NWA World Heavyweight Championship. Eventually it was Wahoo McDaniel who managed to defeat Slaughter, but McDaniel suffered an injury and the gold was awarded straight back to the sergeant. 66 days later Slaughter got his comeuppance as Wahoo regained the title sending Slaughter out of the picture. That did not deter the Drill Instructor though, he found himself a young recruit and began abusing his new partner much like he allegedly got discharged from the Corp for. 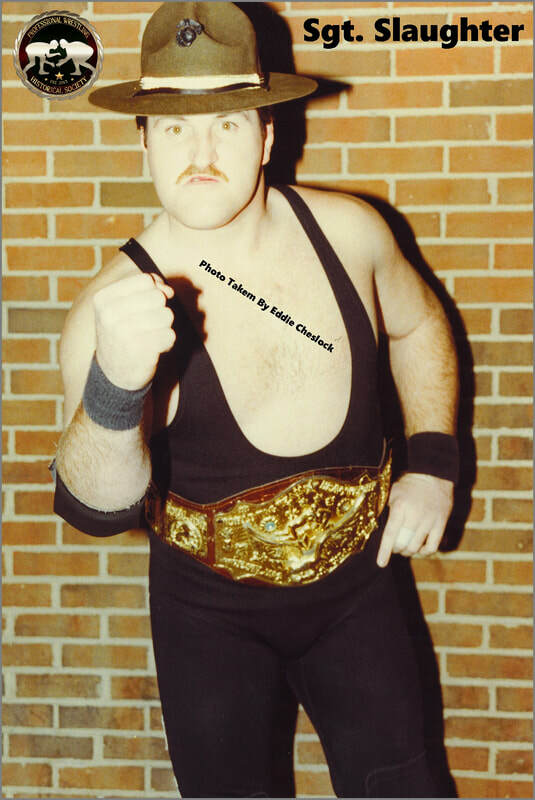 The young recruit was Don Kernodle and the duo were quickly awarded the vacant NWA World Tag Team Championship (JCP Version) in September of 1982. They held the title until March of 1983. The loss came at the hands of Ricky Steamboat and Jay Youngblood. The next stop for the Sarge was Toronto based Maple Leaf Wrestling which was run by Jack Tunney. On July 24, 1983 Slaughter defeated the legendary "King Kong" Angelo Mosca for the NWA Canadian Heavyweight Championship (Toronto Version). Once again Slaughter held the gold for a relatively short period of time lasting just over 100 days before dropping the title back to King Kong. During his previous run in the WWF he battled the champion Bob Backlund. After losing to Mosca he returned to the WWF to pick up that feud where it was left off. It seems to be around this time as well as the ongoing 'GO-MER!" chants, Slaughter started referring to opponents and civilians as "Maggots" and "Pukes." Backlund and Slaughter sold out Madison Square Garden together. Slaughter was so hated, yet his character was one that could be easily turned into a fan favorite. Vince McMahon Jr. is said to have had the Sarge in mind as one of the few men who could have taken over from Bob Backlund. Playing out this idea in 1984 the turn to babyface was started. There was only one way to make the most hated heel in the company turn babyface and that was to take a foreigner who hated America even more than the American born Slaughter to start a feud with him. That man was the Iron Sheik and the two wrestlers had a brutal feud together. Unfortunately Hulk Hogan arrived on the scene and the now extremely over babyface went onto the back burner as a contingency plan in case Hogan was to get injured. Shortly after Slaughter left the WWF. Remus returned to the AWA and faced all the foreign wrestlers at the time and stayed highly popular in the territory with his babyface American hero schtick. He won the AWA Americas Heavyweight Championship from Larry Zbyszko in 1985, Slaughter only held the belt for a couple of months though. No matter how over Slaughter was the AWA was a sinking ship in the final days of life due to the changing landscape of the promotional wrestling scene at the time. Still Slaughter had a very large fanbase, having his image used as a special edition G.I. Joe figure. and very lucrative deal with the brand. From 1986 - 1990 the Sarge traveled among the promotions that were left. None of them were stable though so Slaughter always returned back to the AWA which was slightly - slightly - more stable than the rest. He continued to feud with the foreigners mainly the guys in Sheik Adnan Al-Kaissey's group. In a last ditch effort the AWA tried one last push to regain ratings and teased Slaughter winning the world title, the AWA couldn't survive on Slaughter alone though. Soon after Slaughter returned to the WWF once again as a babyface - initially - we all know what happened there. A lot of people do only know of his time from 1990 onward and based on that alone they say he is a legend. If that's the case when you take all this from 1972 when he trained up until 1989, what does that make him?